﻿ Witch Quest - J-RPG Blog! 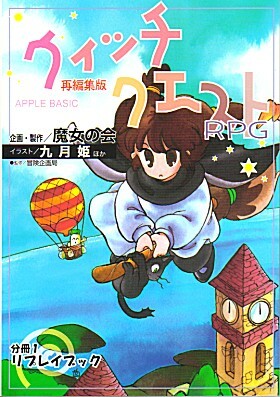 I've been in the process of reading through my new RPG purchases, starting with the Tsugihagi Honbo doujins. Doko ni Demo Aru Fushigi is proving to be surprisingly interesting because it has a transcript of a lengthy dialogue between Kamiya-sensei and South of Majo no Kai, the circle that puts out a print version of a game called Witch Quest. In WQ you play either a 13-year-old witch girl, or a witch's 1-year-old cat familiar, and deal with everyday problems. From the sound of things, it's neat game, and the fact that it's available as a free text file (there's also an HTML version) is a plus too. Anyway, I'm pretty much swamped right now myself, but I was wondering if anyone was interested in seeing a translation of this game, and if anyone wanted to help with an effort to make it happen? I am very interested in a translation. Kiki's delivery service is my daughter favorite movie and my wife and I love it also. I think, I'll give a look to the text file. I am a real beginner but with some help from perapera-kun in Firefox I can at least browse the general meaning of the pages. But, I think it's still one or two years too early to realy help you (or maybe for some editing but english is not my native langage). But there is definitely some interest here. Yeah, Witch Quest is an underground classic (well, now it's been pretty much aboveground for a while, but still). It's pretty expansive, though: Three full books, plus dozens of tarot cards. That's a lot of work, but it's a solid "honobono" game with a fanbase far and wide in Japan. I find it interesting that Book 1 (replays) comes first, before Book 2 (Rules). I could use this to get myself to pick up my study again. But what makes it different from other "Magical Girl Heartbreakers"? Is it diceless or super crunchy tactical combat? What is the calendar on the charasheet for? There must be some reason it has such a huge following, this genre should be a No-Brainer for a japanese Designer. What makes it stand obove the other RPGs like Night Wizard? Someone else will have to answer the question of what makes it so neat. I get the impression that it's relatively rules-light, but does use dice. It also has the advantage of there being a free version that (I think) we could translate with impunity. I am curious what's different for the print version, especially since it has three books instead of two. Wanting something to do to occupy myself, I went ahead and started translating the free version of Witch Quest. I've posted up some more details on my blog, and anyone who wants to lend a hand is more than welcome to. I'll be working on it off and on, depending on how inspired I am and how much other more important stuff I have to work on. I went ahead and made a PDF of the cards. Hey guys. I just wanted to let you all know that I finished translating Book II and put it up on my blog! It's a very interesting game, very quirky and a bit old-school in certain ways.